Text © Copyright January 2011, Maurice Pullin; licensed for re-use under a Creative Commons Licence. Images also under a similar Creative Commons Licence. Great Britain 1:50 000 Scale Colour Raster Mapping Extracts © Crown copyright Ordnance Survey. All Rights Reserved. Educational licence 100045616.
upstream, boats would tie up here. The horse was then taken to the lock, the towrope floated back under the bridge to this point to be reattached to the boat. John was one of the characters of the Kennet and Avon Canal. More importantly in the 1950s he was instrumental in helping to keep the canal open. He operated a pair of boats in the Newbury area, bringing salt from the Cheshire salt fields to the Hovis factory at West Mills as well as other trading. In the 1950s the then managers of the canal, the Docks and Inland Waterways Executive, closed various locks as they could not afford their maintenance. John Gould served an injunction for loss of earnings and won an out of court settlement of £5,000. He used this money to help form a campaign, later to become the Kennet and Avon Canal Trust, to campaign against the closure of the canal. Over 40 years later, in 1990, he was able to be at the reopening of the canal. His knowledge of the canal in the Newbury area was unparalleled, and he was a regular attendant at Newbury Lock, so it is appropriate that he is remembered here. Leaving Newbury Lock the navigation becomes interesting. One of the sections of the River Kennet flows in strongly underneath the bridge to the left, whilst another branch comes in from the right. Then follows the narrow Northbrook Street Bridge, where there is no towpath and the river flows through strongly. A few hundred metres downstream is Newbury Wharf. Only just noticed this information display on the Kennet and Avon Canal which is on a wall beside the lock in Newbury. Lock 85, with a rise of 5 feet 3 inches. The Kennet Navigation was constructed from Reading to Newbury in 1723. In 1788 plans were put forward for a canal from Newbury to Bath, and these received approval with an Act of Parliament to build the Kennet and Avon Canal in 1793. 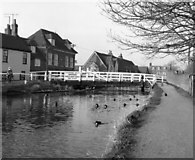 Newbury Lock, here, was the first lock to be started in 1794 and two years later the canal was usable between here and Hungerford. Lock 85, with a fall of 5 feet 3 inches. It is, I believe, the only lock in the southern part of the canal system that has "Jack Cloughs", the manually operated paddles seen here that are levered open. They are not used these days, unfortunately, as the lock also has gate paddles. They are a common method of lock operation on Yorkshire waterways. This 1976 view by Dr.Clifton shows the bridge in pre-restoration days in pristine condition. The bridge was in use for local traffic. The narrowboat Escargot moves through West Mills swingbridge and heads to the bank for to pick up the other passenger who is about to close the bridge again. Approaching the swing bridge at West Mills. In former times there would have been a lot of canal activity here as boats offloaded flour and salt for the Hovis factory on the left. The building now houses desirable flats. The original Monkey Bridge was an arched steel lattice footbridge built in 1935 with a water main pipe underneath. It was commissioned by the Corporation of Newbury under a local employment scheme. However, by 2005, according to West Berkshire council, it had reached the end of its useful life and also did not meet modern day access standards for wheelchairs, prams and bicycles. It was replaced by the New Monkey Bridge which opened in 2008, a couple of metres to the west of the site of the original bridge. It is to be hoped that space was found somewhere in Newbury to reconstruct the attractive original footbridge for display. 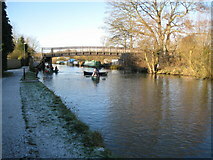 The bridges, old and new, linked the West Fields and Northcroft areas of Newbury via an area of low lying ground between the canal and the River Kennet known as Monkey Marsh, which probably accounts for the name of the bridge. Curiously although the old footbridge was known locally as the Monkey Bridge, that was never its formal title. Now the local moniker has been sanctioned as the formal title. Despite the cold weather a canoe club was out practising slalom manoeuvres through the footbridge support columns. The Kennet and Avon Canal approaches Newbury on the last rural section before the town. 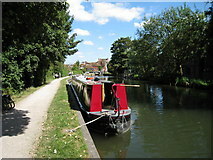 The approaching boat, Rachel, is operated by The Bruce Trust, providing canal holidays for disabled and handicapped people. Their four wide boats all have wheelchair access.